It's not hard to find Savannah GA vacation rentals with room for two, three or four guests. Such accommodations are generally adequate for small families, romantic partners and intimate groups of friends who wish to see the sights and sounds of Georgia's most popular coastal city. However, they might not be adequate for larger groups that wish to enjoy the pleasure of one another's company while experiencing everything that the Savannah GA Historic District has to offer. Fortunately, Southern Belle is alone among Savannah vacation rental companies in offering access to such generous accommodations. At Home at 1014, you'll find everything your plus-sized group could desire - with none of the drama or drawbacks of similarly sized lodgings. Home at 1014 comfortably sleeps as many as 16 guests or as few as a couple. With five spacious bedrooms from which to choose, your experience here is exactly what you wish it to be. No matter how many guests share this incomparable residence with you, three spacious, fully appointed bathrooms - including one with a heated floor - ensure that they'll remain comfortable and relaxed throughout the stay. What's more, 3,000 square feet of usable floor space offers plenty of room to spread out. Other Savannah vacation rental companies look on Home at 1014 with envy. This space is perfect for an intimate business retreat, a long-awaited family reunion or a friendly get-together with a dozen or more of your old classmates. Let's take a look at what this Forsyth Park vacation rental has to offer. Home at 1014 was constructed in the early 1890s and retains many of the historic touches that have captivated residents and travelers over the years. The beautiful "great room" features an authentic chandelier, exposed brick walls and a handsome collection of wooden furniture that wouldn't look out of place on the set of Downton Abbey. Meanwhile, an equally spacious living room boasts a reclining sofa and a plush personal recliner that other Savannah GA vacation rentals simply can't match. If you're expecting a hungry crowd, the incredible upstairs kitchen features immaculate appliances and seating for nearly two dozen guests. On this floor, there's also a master-sized bedroom with a state of the art flatscreen TV and a decorative fireplace that'll bring back childhood memories in a flash. The secluded master bath includes distinctive tiling and a Jacuzzi-style tub that will have you lingering for hours. The two other bedrooms on this floor boast queen beds and flatscreen TVs for guests with refined tastes. For crowds of a dozen or more, open up the singular bottom floor. Down here, an equally impressive master bedroom boasts a powerful flatscreen TV and offers access to a quiet, modern bathroom. The floor's second bedroom includes a queen bed and newly installed flatscreen as well. 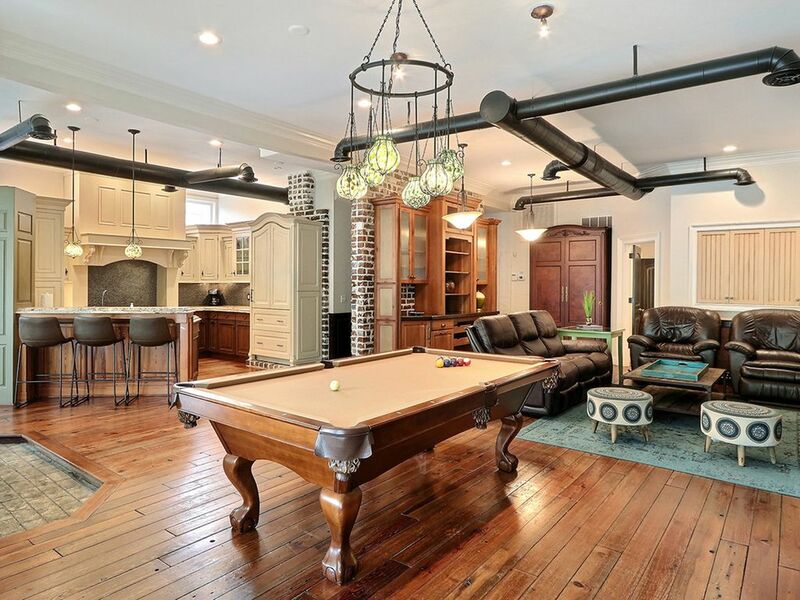 Heart-of-pine floors cover this entire floor of the house, including a stunning game room with comfy couches and a full-size pool table that will have your guests begging to stay in. A 50-inch flatscreen lets you catch the game while shooting a round or two here. If you need some help with planning or logistics, we're happy to offer advice that other Savannah vacation rental companies can't or won't. No matter why you and your group have chosen to visit the Savannah GA Historic District, make Home at 1014 your home base for adventure, exploration and relaxation. With enviable access to the green space of Forsyth Park and the bustle of downtown Savannah, you'll find it hard to leave this charmed oasis. Book your Home at 1014 stay today.